Generac, Kohler, Briggs And Stratton, General Electric, Onan, Baldor, And Tradewinds. Rusting Generator Image. 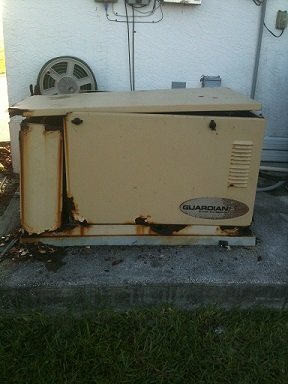 This Generator Was In Terrible Repair And Was Left To Rust. Owner Wanted To Remove And Discard This Rusty Old Generator. 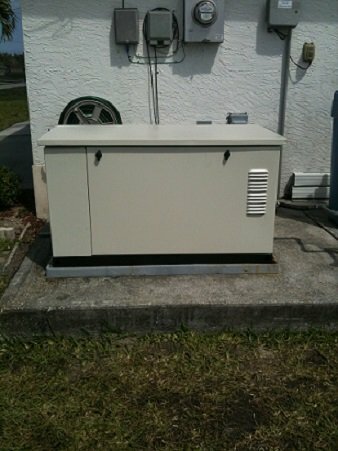 We Installed A New Generator Enclosure And Restored Unit. We Have Generator Enclosure For Sale. Click Here If You Want To Buy A New Generator Enclosure. RCS Electrical Services is your Bunnell generator repair, generator service, generator maintenance, and generator installation solution provider. 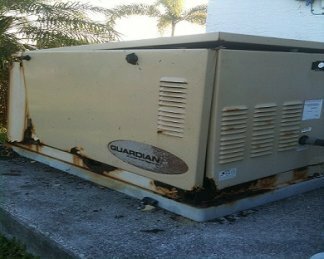 We install, service, and repair all the best brands of automatic standby generators. We are factory certified to perform Generac generator repair, Kohler generator repair, General Electric generator repair, Centurion generator repair, Guardian generator repair, Briggs and Stratton generator repair, Baldor generator repair, Tradewinds generator repair, and Onan generator repair. Check all field electrical connections for tightness and contact. Check specific gravity of battery fluid. Shut down generator and recheck all fluid levels. *There are additional charges for these items. 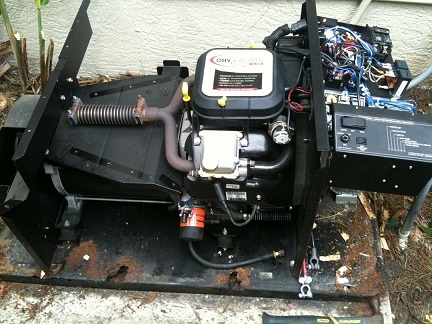 We removed the enclosure on this generator to gain access to its chassis. Observe how rusty it was. The generator engine mounts had fallen through the bottom of the chassis due to its rust. Observe the brand new chassis below the generator. It has been mounted on its new chassis before enclosure is installed. Click here to order a new generator enclosure and chassis. When we first do service on a generator, the cost is $650.00 for air cooled, and $850.00 for liquid cooled up to 60kw. Call for pricing on larger generators. These prices are for propane and natural gas generators only. Pricing is different for all diesel generators. Call for price on larger units. You will receive discounts if you become our customer and sign a five year service agreement. 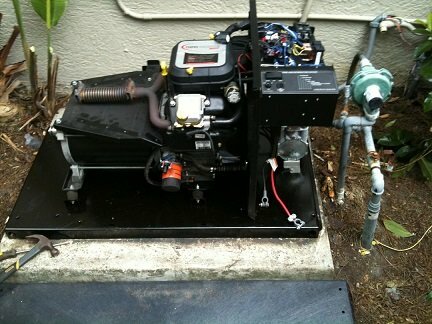 If your generator is not running there is an additional fee of $350.00 for generator troubleshooting and diagnosis. Diesel generator troubleshooting fees start at $490.00. These fees are for standby generator which are less than 100kw. This fee applies to generators under 100 KW. Call for fee rates for larger generators. When is time to do your Bunnell generator repair, contact us. 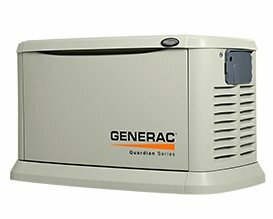 We are your expert Generac generator technicians. Contact us when you are ready to do your Bunnell Generator Repair. Your Bunnell generator repair company also offers a full array of generator maintenance and generator service programs. At the very least your generator service must be done once a year. If you would like a more superior service, we suggest that your generator maintenance is performed twice per year. This gives us the opportunity to observe and correct problems before they become catastrophic. A clear example is when snakes or rodents get inside the generator. If a snake is inside the rotor when the engine start, it will be killed, but it also can damage the generator brush assembly or other vital components of the unit. Mice also can find their way to generators. They can make nests inside the stator or rotor and completely destroy this assembly. We have programs that include up to two free emergency calls a year. Often time during emergencies you may need to have access to us, but we may be busy helping other customers. If you purchase a premium service agreement you will have priority over those other calls. Contact us and inquire about this program.